Cross the bridge and enter a gated Grande Dunes community. You will find yourself in a world of spectacular luxury like no other. Capri Village sits on the golf course/Waterway side of Grande Dunes. Homes and lots face the pastoral greens of the golf course and a few offer picturesque views of a sizable lake. Priced from $500,000 to over a million, these homes are showplaces. Beautiful half-acre home sites on the greens start at about $150,000, and with no building timetable for building, there are many investment opportunities. 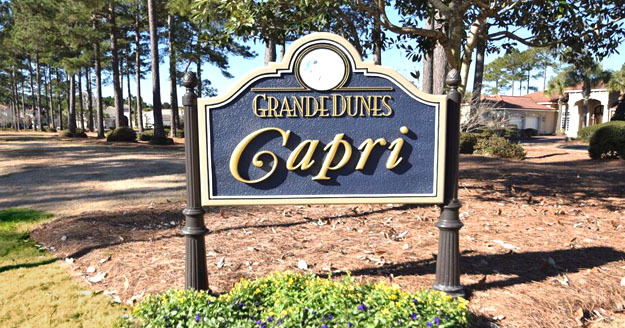 Read more about Capri Village at Grande Dunes real estate. Grande Dunes neighborhoods share amazing amenities starting with membership to the incredible Ocean Club. The stunning oceanfront clubhouse features an award-winning swimming pool, dining poolside or with a panoramic ocean view, private beach access, lounge, locker rooms, changing facilities and much more. With memberships to spas, tennis facilities, fitness centers, and golf courses available, you can tailor your life at Capri Village to fit your lifestyle. Call our real estate expert, Greg Harrelson, at (843) 536-8383 to learn more about the extraordinary neighborhoods at Grande Dunes or schedule a tour of the luxury homes for sale in Capri Village.